I had ten tickets for Friday from Slot 3 through Slot 7. My other issue was that I had a friend in town, and Friday night would be my last opportunity to hang out with him before he flew back home. So despite the prizes involved, and the fact that I had a late Kaotan ticket, I decided to oshi-mashi my Slot 7 tickets which would allow me to get out of Makuhari around 5:15 instead of after 7pm. Anyway, I arrived in Makuhari early to have lunch. They opened a bunch of new restaurants in the Plena mall in front of the station, including a nice Kaitenzushi. I want to try some of those places on future visits. I finally made it to Halls 9-11 shortly before noon. Oh, and let me quickly mention that I had horrific luck with the prizes, only winning one all day. 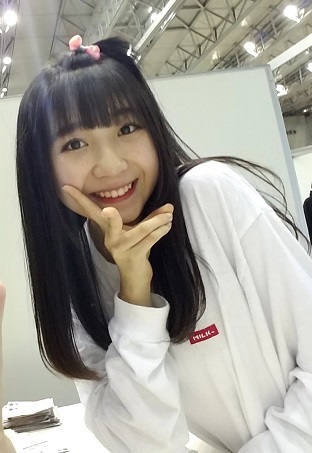 Akiyoshi Yuka (Lane 94) I was bummed that I could not attend the HKT Zenkoku event last weekend since I had things to discuss with Yukachan. She greeted me with her usual “Yaho Kurisu!” and I told her that I watched Sasshi’s solo concert DVD, and loved Yukachan’s parts in it. “The dancing?” She asked me. Yeah, that too, But I also loved the “Akira 100%” VTR and the Zipper performance that followed it. Anyway, she laughed when I mentioned that. Yamane Suzuha (Lane 43) She had a huge sign behind her, and a few balloons taped up in her booth. I did my best to read as much of her sign as I could but the line was moving quickly. I didn’t mention that I didn’t have enough time to read it because I know she will tell me to subscribe to her mobame, LOL. 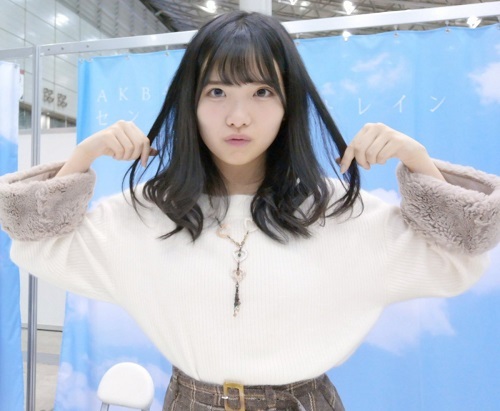 Instead I asked her about her performance in the 48-group singing contest (this is something I brought up with most of the members) She told me she hadn’t performed yet, but she will do her best. While I was in the queue I noticed Ishiwata Sena a couple lanes over looking cute as ever. I considered doing oshi-mashi with her again, but ultimately didn’t go for it. Also, it was about this time I ran into my friend Koba, as well as a fan named Andrew (I think he’s a forum member) and Vladimir We talked for a short while before we all had to run to our next tickets. Akiyoshi Yuka (Lane 94) Back with Yukachan, I decided to compliment her on her extremely comfortable looking hoodie that she was wearing. She agreed that it was very warm and soft. “So you sang Superfly, huh? I wanna watch it!” She told me to be sure and watch it. Yamauchi Mizuki (Lane 55) This was the one ticket that I was eligible for the “Poster” prize, which I have never won before. And I didn’t win it this time either. I knew she hadn’t done her song contest performance yet, but I told her that I also love Secret Base, and I remember it from Anohana. She told me it was her favorite song, and that’s why she wanted to perform it. Fuchigami Mai (Lane 97) I haven’t been seeing Maichan as much as I used to, and in a way I have ‘lost my groove’ with her, but I still really like her. I had more tickets for this slot than usual, and Maichan’s lane was moving at a snail’s pace. I was cursing myself for not going to her last, since I am aware that she always takes her sweet time doing the signings. Eventually my turn came. 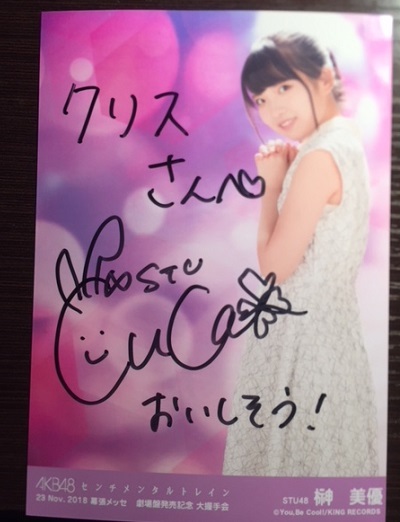 She gave me a quick “Hisashiburi” and immediately reached for the signed jacket until she realized I hadn’t won it. I asked her how her singing performance went. She asked me if I know Angela Aki. I know one of her songs, but not the one Maichan sang. But I told her I looked forward to seeing her perform. iirc, she isn’t a bad singer. Kobayashi Ran (Lane 59) <two tickets> I quickly made it across the hall to Ranchan’s lane. 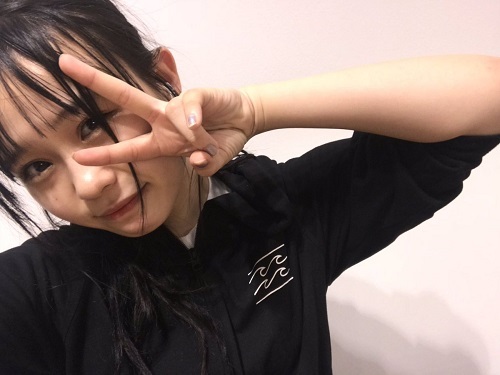 I wanted to get there before 3:30 because lately she has been getting a ton of people doing oshi-mashi in her lane. I made it around 3:27 and quickly checked in. Now of all the prizes I was eligible for, this was the one I really wanted to win. I wanted to have a 2-shot and/or a video of Ranchan since I have never done either with her before. I didn’t win, drats! I would have one more chance later though. In the meantime I was watching her do the 1-shot video for the people who won. She was doing like 45 second videos for everyone. Damn!!! I really want this! Also, while I was in queue I was watching Honda Sora in the neighboring lane being totally genki with all the people in her queue. In fact I could hear various people muttering about it while I waited. She is another draftee I have wanted to meet, but hadn’t had the chance yet. When it was finally my turn Ranchan gave me a really excited greeting. I told her that I loved watching her dance in the booth. After she thanked me I said that “I am Ihoujin!” She looked confused for a second until she realized I was talking about the song she is going to sing in the competition. Just then I was getting pushed out, I would talk to her more about it in a few minutes. (Second Ranchan ticket) I was debating doing oshi-mashi with Sorachan, but I wasn’t sure I would have enough time for my second Ranchan ticket. Plus, Ranchan’s queue was really long. I decided to go with Ranchan first, and it there was still time afterward I would consider Sorachan. Oh, and once again I lost for the prize. WTF??? I was now 0-7 on prizes, and I thought Ranchan would be one of the easier ones to win. Not to mention that almost everyone in front of me and behind me had won. So I just had rotten luck. As the clock ticked closer to 4pm it was finally my turn. I told Ranchan that I really like Ihoujin since it is a song Wasamin sang on her 3rd single, and Wasamin was the one who pointed out that the song was about me, LOL. All of a sudden she started singing it. I only know some of the lyrics, but I hummed along with her just the same. As I left the lane it was 4:02, too late to see Sora-chan…. Honda Sora (Lane 58) <oshi-mashi> As I left the lanes it was past closing, but to my surprise they had not yet closed Sorachan’s lane. I guess it was meant to be, so I jumped into the lane and quickly checked in. The other issue was that the lane was right next to Ranchan, so I did my best to hide from her so there wasn’t any awkwardness, but that was a bit difficult since her booth looked directly at Sorachan’s queue. 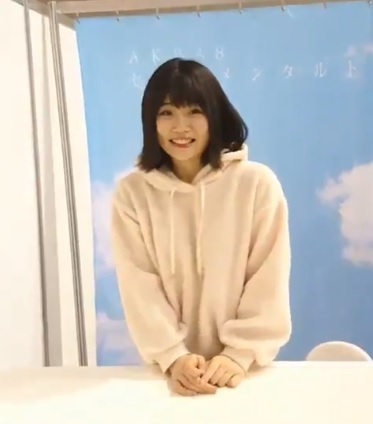 In any case, eventually it was my turn, and I got the usual excited greeting that I always seem to get from the 16th gen and 3rd gen draftees since they have seen me in the theater quite a few times. 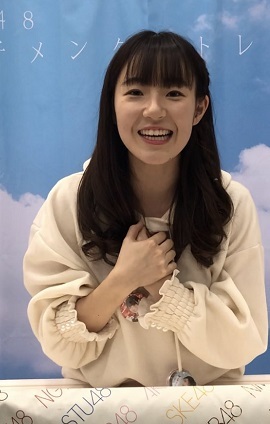 So after Sorachan gave me the “You’re that guy!” line I immediately told her that she is awesome in “Blue Rose” and that I really wanted to meet her. That got a good reaction, so it was another successful first-time meeting with an AKB draftee. There were a lot of people I know at the event, although I was having a hard time meeting with everyone since we were all so busy. I did have the chance to chat with BigC a couple times since he was always hanging out in the HKT area, which I visited on multiple occasions. Personally, the prizes are totally secondary to getting to talk with the members. At the same time, it’s nice to win. Everyone is walking around with posters and signed pics and whatnot, and when you have been skunked all day it begins to get depressing. Otani finally finished up and Cuca came out a short time later. I commented on the fall colors of the outfit she was wearing, which was really cute. Speaking of fall, I told her that I had an American Thanksgiving dinner the night before. She seemed kinda surprised, but I told her that there are quite a few Tokyo restaurants that serve an American-styled Thanksgiving dinner. But at the end of the day, her outfit was really cute, and I got a nice signed pic, so cool! Murakawa Bibian (Lane 111) <oshi-mashi> I wasn’t going to turn down an opportunity to help someone experience the awesomeness of Bibian. Despite her queue being long, it moved relatively quickly, and we could see Bibian being completely genki with everyone in her booth. Eventually it was my turn, and after the usual pleasantries I used my time to introduce her to my friend, since bringing a friend to the lane usually earns you a “gold star” in the eyes of the members. (I know Wasamin is always happy when I bring people to her events) Bibian switched to English with me toward the end of the handshake. She was awesome, as usual, and I am pretty sure she gave my friend the royal treatment. It took a little longer than I had planned, but I got out of Makuhari early and made it to Central Tokyo by 6:30. So I had plenty of time to enjoy a nice dinner with my friend before he headed back to California. At this point, and for the first time in a long time I have no AKB tickets whatsoever, aside from the NO WAY MAN tickets which are scheduled to arrive next week. (Also waiting on SKE’s sale) I’m still unsure of my December schedule. But if they do another resale, and I am in town, I may consider grabbing a few tickets for the Christmas handshake event. We’ll see.